Right to clean and health environmental is protected within national and international laws. One of the ways of promoting this right is by having in place environmental regulations. The major tools on environmental regulations are environmental impact assessment and environment audit by National environmental management authority as an agency empowered to oversee environmental protection and conservation in Kenya. 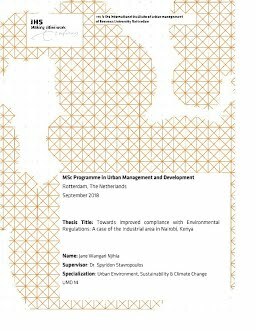 The objective of this study was to determine factors that influence compliance of environmental regulations in industrial area in Kenya. The study was guided by three specific objectives being determining the social, technical and institutional factors impacting compliance or non-compliance with environmental regulations. The study reviewed literature related to environmental regulations, environmental governance and factors that affect non-compliance to the environmental regulations. Factors that contribute to non-compliance were also analyzed from relevant theoretical literature and empirical situations. The study primarily applied desk research strategy with focus on secondary quantitative data. This strategy was suitable for this kind of research as it was covering an industrial area and since the factors are known from the literature review, the research has explained these factors from the empirical situation. The research was exploratory in nature and used quantitative secondary data to analyse the relationship between dependent (Y) variable and the independent (X) variable. The secondary data was collected from both NEMA and Nairobi City County government. The study collected information of 138 firms from nine sectors. The data that was collected from the secondary sources was cleaned, tested for errors and coded in a code book and then imported to SPSS for analysis. The analyzed data was presented descriptively and quantitatively by use of percentages and frequencies generated in tables and charts. Descriptive analysis was to elaborate on the characteristics of variables and the relationship that existed between independent and dependent variables and logistic regression analysis was toexplain the relationship between independent and dependent variables. Study findings revealed that majority of the firms representing 58.7% in industrial area are non-compliant to environmental regulations. Further it revealed that social factors being the number of awareness campaigns attended and consultation when introducing new or amending regulations can contribute significantly to the firms complying with the environmental regulations. The institutional factors that contribute significantly on non-compliance are budget of compliance, staff training on environmental compliance, establishment of an environmental department and the level of operation. On technical factors that influences compliance are inspection, experience in penalty/sanction and location of a firm though it has a negative coefficient. The study concluded that majority of the firms do not comply because stakeholders do not have knowledge or awareness on environmental regulations, weak enforcement mechanisms, the cost of compliance is assumed to be high among other reasons. Study recommends that government officials must take the initiative of routine monitoring and inspecting all regulated firms. Parliament should enact and amend laws and as well formulate programs on environmental compliance including providing stringent measures and fines. Creation of enforcement mechanism and framework to enable all stakeholders participates enhances compliance to environmental regulations. It further recommends good environmental governance and adoption of best practices for compliance.